Catena will today acquire and gain access to five logistics properties valued at a total of SEK 1.1 billion. The purchase consideration will be paid in part by means of 1,678,017 newly issued shares in Catena, making Kilenkrysset one of the five largest shareholders in Catena. Kilenkrysset and Catena are initiating a partnership in the logistics sector. Catena and Kilenkrysset have today signed an agreement according to which Catena acquires five properties in the Stockholm region with an underlying property value of SEK 1,104 million. The properties are being acquired through corporate transactions with the purchase consideration for the shares amounting to a preliminary sum of SEK 608 million, of which SEK 250 million is to be paid in the form of promissory notes which, according to the agreement, are transferred by the seller as payment for newly issued shares in Catena. In other regards, the acquisition will initially be financed by means of Catena's cash and bank balances. The shares are being issued to partially finance the acquisition. The share issue is directed to the sellers, Kilenkrysset's wholly owned subsidiaries Rödfalken Invest AB and Mino 425 AB, (the name of which is being changed to Kilen 128 Strängnäs AB). The issue has been fully subscribed and paid through the acquisition. In accordance with the above, the share issue represents a capital contribution of SEK 250 million. The subscription price for the issue of about SEK 149 per Catena share is based on the average closing price over the ten most recent trading days, meaning that Kilenkrysset, through its subsidiarie, holds 1,678,017 new shares in Catena, corresponding to 4,49 percent of the total number shares following the issue. The new share issue has been approved by the Board of Directors of Catena, supported by the authorization granted to the Board of Directors by the 2017 Annual General Meeting of the Company. All of the properties are located in the Stockholm region, with a lettable area of ​​approximately 91.5 square metres, a rental value of SEK 57 million and a remaining average lease term of 9.6 years. The Eskilstuna Källstalöt 1:6 and 1:7 property is a logistics warehouse with a lettable area of 32,200 square metres with which Volvo as tenant, and a rental value of SEK 15.1 million. The Enköping Stenvreten 8:33 property is a freezer warehouse with a lettable area of ​​10,876 square metres with Coop as tenant, and a rental value of SEK 15.1 million. The Sigtuna Rosersberg 11:81 property is a distribution warehouse with a lettable area of ​​22,605 square metres with Samdistribution as tenant, and a rental value of SEK 15.2 million. The Sigtuna Rosersberg 11:116 property is a logistics warehouse with lettable area of ​​10,072 square metres with Stena Recycling as tenant, and a rental value of SEK 9.6 million. The Norrköping Statorn 31 property is a logistics warehouse with a lettable area of ​​15,708 square metres, of which 2,281 square metres are vacant. The tenants are Ocay and Strukton Rail and the property has a rental value, when fully leased, of SEK 6.9 million. The properties include additional developable land of approximately 150,000 square metres. "There are a few people I look up to in Swedish business - two of them are Erik Paulsson and Gustaf Hermelin. Erik and Gustaf have an admirable history of developing not only real estate but entire neighbourhoods and, at the same time, they share Kilenkrysset's business culture and values. We view this transaction partly as an opportunity to obtain a long-term financial position in a well-managed company, and partly as the start of a strategic partnership between Kilenkrysset and Catena. With Catena's professional management organization, we also feel confident that our tenants are in good hands." says Jan Persson, Chairman of the Board of Kilenkrysset, jan.persson@kilenkrysset.se. 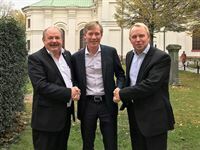 "The acquisition strengthens our position in the Mälardalen valley with, for Catena, new tenants and long-term leases generating good cash flows. The development rights accompanying the properties mean there are good opportunities for new production, which is in line with our strategy for how we want to grow. Through the acquisition, Catena also gains a new long-term and strong owner with extensive expertise in properties," says Gustaf Hermelin, Chairman of the Board of Catena. Catena’s mission is to own, effectively manage and pro-actively develop properties in prime locations that offer the potential to generate a steadily growing cash flow and favourable value growth. Catena’s overriding goal, based on its focused orientation, is to give shareholders a favourable long-term total return. As of 30 September 2017, the properties had a total value of SEK 11,750,0 million. Catena AB is listed on the Nasdaq Stockholm exchange. This information is such that Catena AB (publ) is obliged to publish under the EU Market Abuse Regulation. The information was provided by the contact persons mentioned in this press release, for publication at the time stated above.